So it's Sunday and you know what that means? The Scott/Boast Family Brunch! This is one of my newest tradition ideas and it seems to be a HUGE hit with my kiddos. I really believe that traditions make kids grow up to be happier and better parents. It gives them something consistent to look forward to. When I was growing up, my daddy would take my family to downtown Atlanta every Christmas Eve. It was my idea, because as a small child I was still awestruck by the big buildings and the bright lights. One Christmas Eve, I begged him to drive downtown, and after much coaxing, he finally gave in. We never got out of the car and that was fine with me. We just drove around and oooh'd and aaah'd over the skscrapers and twinkling lights. That went on for a few years until it evolved into a trip to Stone Mountain. Now at 30 and with kids of my own, I still love coming up with new traditions. Hence my "brunch" idea. I always start cooking around 11:30 so that everything is ready by 12:30 or one. We like a late brunch. Brunch traditionally is anytime between 11:00 and 2:00. So far I haven't repeated any of the dishes, but it's kind of fun trying to come up with breakfast and lunch dishes that compliment each other. And I like for my brunch to be a little fancy so I like to garnish the orange juice glasses and set up pretty bouquets of flowers and make sure all the dishes match. When you have four kids, that's about as fancy as you can get! My last brunch consisted of fresh mozzarella and bacon grilled cheese sandwiches, fruit salad with vanilla pudding, garlic biscuit knots, prosciutto and pepper omelets, and blackberry shortcake pancakes. I always cut up the sandwiches or french toast into quarters. And if I'm serving pancakes, I make sand dollar sized ones in stacks of three. That way it's more like a sampler plate. This allows me to make a wider variety of dishes. I have also started collecting all of my frappucino bottles to serve milk in because they look like small old timey milk bottles. All in all, family traditions are important. And i urge every mom to come up with a new one every now and then. Your kids will love you for it! Here's some ideas if you want to start your OWN brunch tradition! Preheat oven to 375 degrees. Lightly butter 6 standard muffin cups. With a rolling pin, flatten bread slices slightly and, with a 4 1/4-inch cookie cutter, cut into 8 rounds. Cut each round in half, then press 2 halves into each muffin cup, overlapping slightly and making sure bread comes up to edge of cup. Use extra bread to patch any gaps. Brush bread with remaining butter. In a large skillet, cook bacon over medium, until almost crisp, 4 minutes, flipping once. (It will continue to cook in the oven.) Lay 1 bacon slice in each bread cup and crack an egg over each. Season with salt and pepper. Bake until egg whites are just set, 20 to 25 minutes. Run a small knife around cups to loosen toasts. Serve immediately. In a small saucepan, bring the cranberries, orange juice and sugar to a boil. Reduce heat; simmer, uncovered, for 5 minutes. Cool slightly. With a slotted spoon, remove 1/4 cup cranberries; set aside. In a blender, process cranberry mixture until smooth. Transfer to a small bowl; stir in maple syrup and reserved cranberries. Keep warm. In a large bowl, combine the biscuit mix, sugar and baking powder. In another bowl, whisk the eggs, egg yolk, milk, orange juice and peel. Stir into dry ingredients just until blended. Fold in chopped cranberries. Drop batter by 1/4 cupfuls onto a greased hot griddle; turn when bubbles form on top. Cook until second side is golden brown. Serve with syrup. Garnish with orange peel strips if desired. Yield: 12 pancakes (1-1/4 cups syrup). 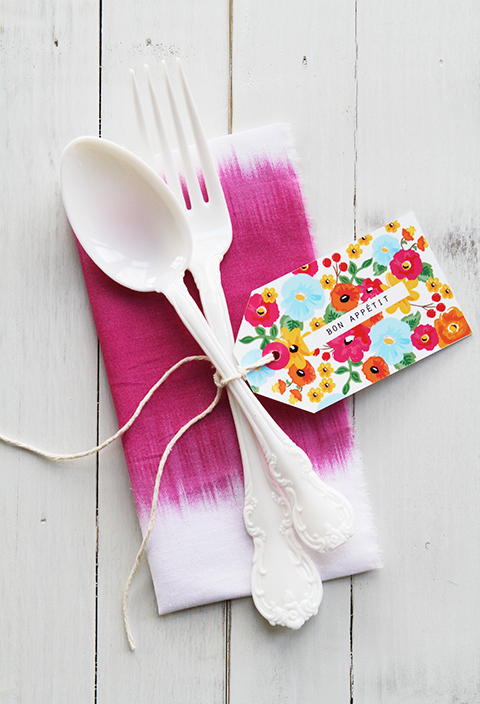 Super cute idea for eating utensil presentation!